With the success of Eagle comic in 1950, Hultons feminised the comic’s format and launched Girl in 1951 before adding the nursery title Robin in 1953. Seeing the potential for an androgynous title that would span the gap between Robin and their older titles, in 1954 they added Swift, an “Exciting new magazine for boys and girls”, for children aged 7, 8 and 9. The last of the Eagle flock to be born, it was also the first to be culled when, despite having been realigned as an older Eagle-style boy’s comic with “Companion To Eagle” in its title box, Swift was amalgamated into Eagle itself with the 9 March 1963 issue. Swift lasted just under nine years although, due to the volume numbering system applied to the whole family, its last issue was in fact v10 #9. 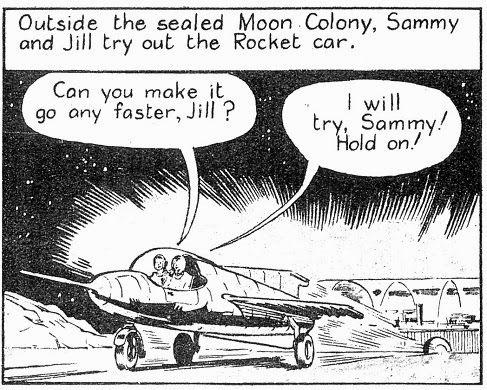 Retitled from “Sammy And His Speedsub” to “Sammy In Space”, the story beginning in Swift dated 9 February 1957 saw Sammy land on the Moon Colony where he meets his cousin Jill. Perhaps Sammy’s parents’ permission to travel to the moon with a scientist he has never met before isn’t quite so outlandish when you realize that their niece was already there, however the introduction of his female cousin gave the now much more adventure orientated strip a female protagonist for the girl readers of Swift to relate to. 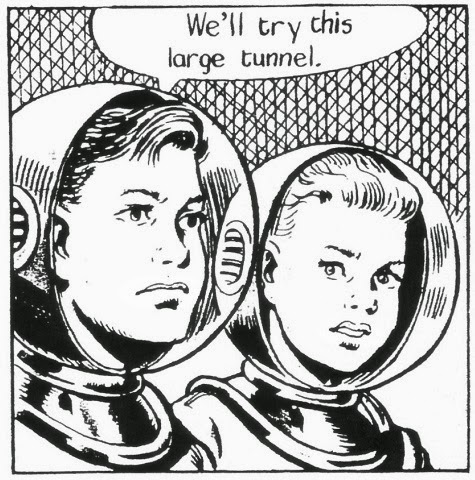 The unnamed scientist is soon forgotten as the cousins take the newly re-engined rocket car on a test flight during which they discover a damaged spaceship and rescue its passenger who turns out to be the Governor of the Moon Colony itself. With such an important friend they are able to retain the new engine and the second party of their adventure takes them underground on an unexplored area on the dark side of the moon where they discover the humanoid race of Moon Dimps. The third part of the ongoing story has Governor Rogers leading an expedition to the Moon Dimps’ city where, after a moonquake and various misunderstandings between the two species, they make friends. While the first part of the story is a reasonable childish adventure, the two Moon Dimp stories set in underground caverns with waterfalls, floods and a breathable atmosphere, along with a herd of Moon Cattle, does strain credulity somewhat. However this story introduces the recurring characters of the alien boy Dimple and his pet Flap who was a sort of a cross between a cat and a sea-lion. 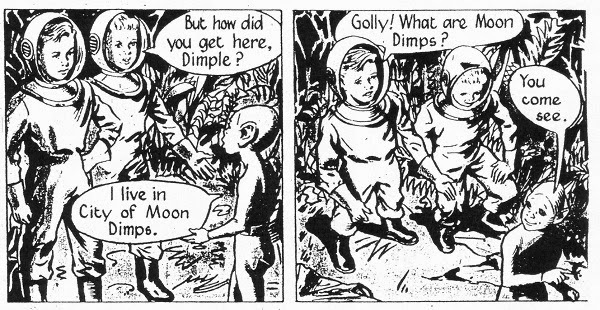 After all this lunar lunacy the strip then literally comes down to Earth with the Governor getting the children into what he refers to as “Space Cadet School at Earth Space Fleet Headquarters”. As of the issue dated 14 December 1957 the series relocates to Earth with the title being readjusted to “Sammy And The…” for the majority of the remaining stories. 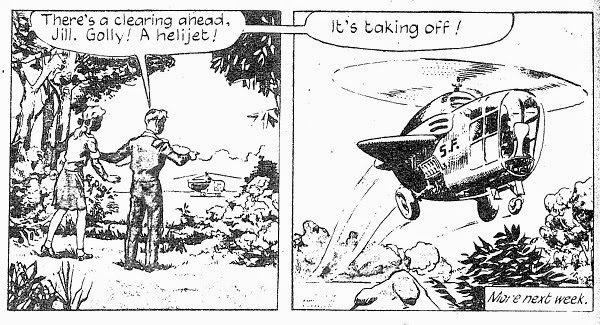 After using Space Fleet uniforms and space suits straight from the Dan Dare strip in the Sammy Moon stories, the new location of the series is set in the second panel which showed a helijet flying over Dan Dare’s Space Fleet Headquarters whilst the close up panel of a helijet the next week reveals the letters “SF” on the fuselage. The first of the Earth based stories is "Sammy And The Missing Test Pilot" which introduces the character of test pilot Captain Ace Silver. 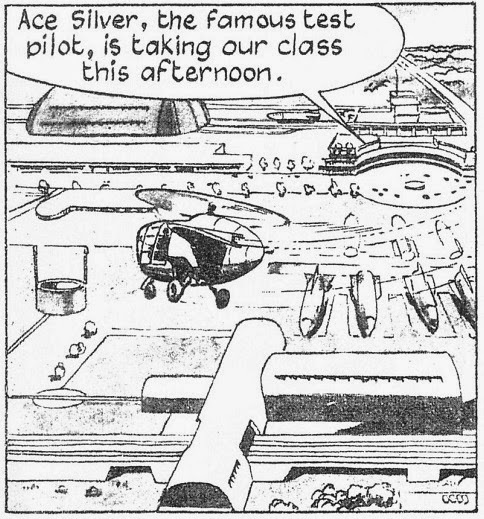 Silver is effectively the strip’s Colonel Dare character for the children to look up to and, once they had helped him escape from his kidnappers, he become a kind of mentor in the same way that Governor Rogers had been on the Moon. So when Silver is assigned a tour of duty at the Naval base in "Sammy And The Missing Convict", Silver is able to bring Sammy and Jill long so they can gain more experience. 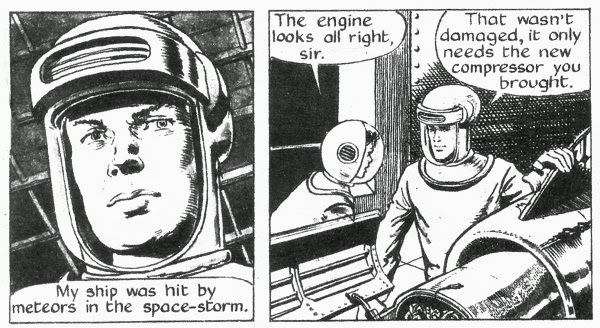 Silver also features in "Sammy And The Space Bandits", again playing very much the heroic Dan Dare character, as well as "Sammy And The Space Race". In "The Space Race", Silver is due to fly his racing ship in an international space competition, however he needs a spare part which Sammy and Jill fly to Earth to pick up. One of Silver’s competitors, Speer Milano, is so determined to beat him that he disables the children’s rocket car, then attempts to force them to crash and potentially starts the fire which engulfs the spare parts factory. 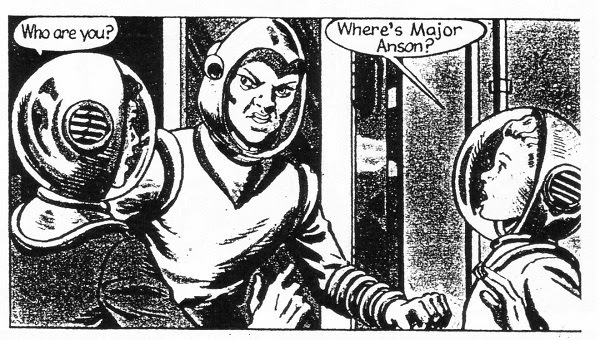 Remarkably, after all that, he barely gets a telling off from Silver who is more interested in getting Sammy to win the race for Space Fleet than in dealing with Milano’s sabotage, potential arson and his attempted murder of the children. This does highlight the fact that to modern adult readers the adventures that the children undertake are not just dangerous but are potentially deadly. That, of course, is what made them exciting to the young Swift readers each week as the children showed themselves to be as good as, if not better than, the adults around them. This is shown in "Sammy On Ceres" in which the two cousins, along with Cadet Tony Brent, fly to the planet Ceres where they are able to find and then rescue Tony’s father after all Space Fleet rescue attempts had failed to locate him. 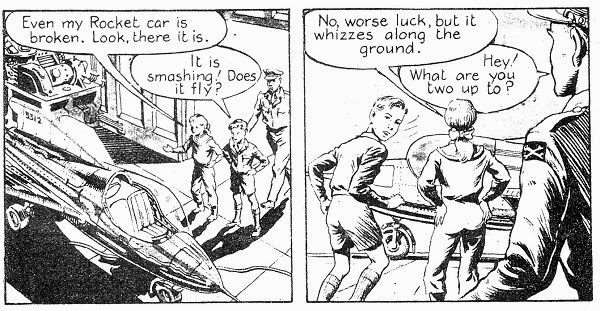 It is interesting to note that those few Sammy stories that include aliens or that are set on world’s other than the Earth, avoid those world’s that were already well explored in the Dan Dare strip in Eagle. Sammy visits the Moon and Ceres, the largest object in the Asteroid Belt and now designated a dwarf planet, while the aliens in The Research Station are Uranos from Uranus. These were all places that were either not visited or not major plot points in the Eagle strip up to that time. As it was the Sammy In Space stories started in Swift at the end of the "Rogue Planet" story in Eagle while the last episode of "The Dinor Mystery" was published in Swift on the same week as the first Frank Bellamy "Terra Nova" episode was published in Eagle v10 #28. Of course Sammy never goes to Mars or Venus and there is certainly no mention of the menace of the Mekon or the Treens in the Swift strip. 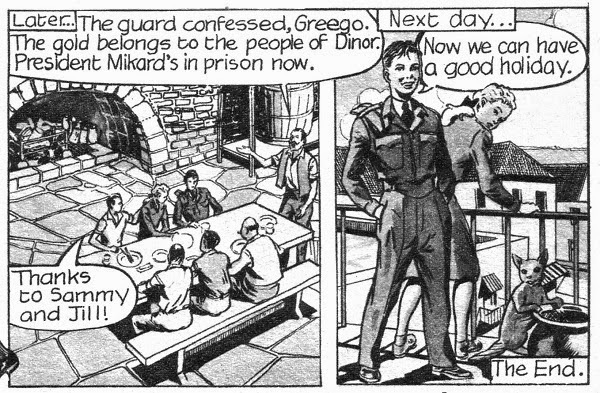 The strip concludes with "Sammy And The Dinor Mystery" which sees the cousins taking a holiday on the Mediterranean island of Dinor and getting involved in political intrigue between the corrupt President Mikard and a rebel boy named Greego whose uncle was killed by the President. This story is the shortest of all the weekly Sammy stories and concludes very rapidly in the issue dated 29 August 1959. This was the first dated issue of Swift immediately after the industrial strike that had also affected the other titles in the range and was shown by the dates being removed from the comics as the publishers did not know exactly when they were going to be published. It was an unusual story for the strip with little connection to Space Fleet and without any science fiction concepts although, unusually, it does show the two cousins fighting other children. The Dinor story ended with Sammy, Jill and Flap looking out of the panel at the reader as Sammy declares, “Now we can have a good holiday” as the blurb at the bottom of the page announced “Look out! The Bouncers are coming! See this page next week.” Bruce Cornwall remembered, “Sammy came to an end because they wanted to develop other things” and in Swift v6 #30 the adventurous Sammy strip was replaced by the humorous Bouncers strip. Today the majority of Eagle belongs to the Dan Dare Corporation while the majority of Swift, along with Robin, belongs to Look and Learn Ltd. However, like Girl, a few of the Swift strips – including Sammy – belong to DC Comics through Time Inc UK (the former IPC Media). While there have been several small run books reprinting Swift strips such as "Robin Hood" and "King Arthur And His Knights" published by Book Palace Books, these were licensed from Look and Learn Ltd and the chance of an official reprint of any of the Sammy stories, belonging as they do to an American company, is virtually non-existent. 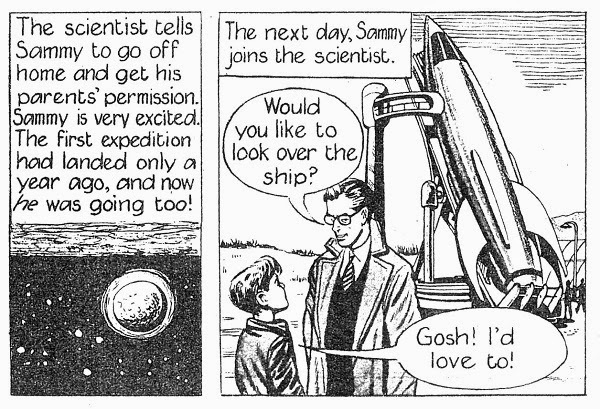 Despite being aimed at a more junior readership than the main Eagle strip, the Space Fleet based Sammy stories in Swift are nevertheless an interesting tangent within the main Dan Dare universe, albeit one in which the interest for today's adult readers lies more in their curiosity value than in their story content.